The Plains branch opened on January 20, 1991. 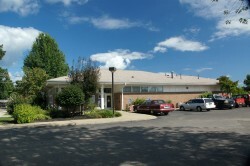 It was the first branch in the Athens County Public Library system to be built specifically for library service. It heralded in a new era of library building projects; locations had previously been rented spaces or converted storefronts. Encouraged by the continuing growth of The Plains community, the library doubled in size during a quarter-million dollar expansion project in 1999. The branch’s central location in the county makes it a popular spot for residents from neighboring communities. The library has a modest study and play area for children. We feature public computers in our kids’ section for the convenience of the children and their parents. Programs for children are provided regularly, including preschool story time, after-school programs, and our countywide summer program, Summer at the Library. A full-time children’s librarian is on staff.